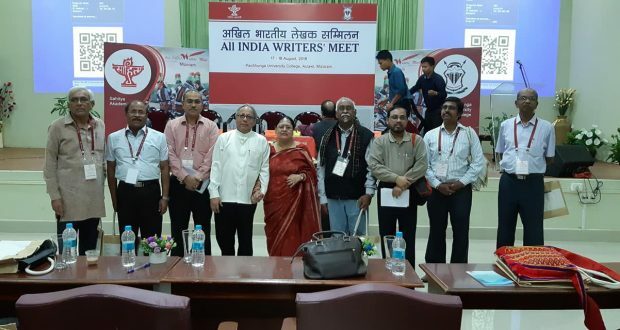 Aizawl(Mizoram}20/8/18:All India Writers Meet, organised by Central Sahitya Akademi, New Delhi, at picturesque Aizawl, the capital city of Mizoram. The two-day Meet was formally inaugurated by Haraprasad Das, eminent Odia poet, thinker and critic after a very illuminating keynote address to a gathering of writers from across the country. Senior writers of the major states, besides half a dozen of very promising young poets, representing languages like Tamil, Hindi, Nepali, Punjabi and Mizo, etc. participated in the event. The well-known poets who took part in the Meet were: KG Sankar Pillai (Malayalam), Sameer Tanti (Assamese), Meera Kant (Hindi), Chaitali Chattopadhyay (Bengali), Prathibha Nandakumar (Kannad), Bhagaban Jayasingh (Odia), Udayan Thakker (Gujarati), Nandini Sidda Reddy (Telugu), Vrajesh Solanki (Marathi) Manju Jaidka (Punjabi), etc. The only Konkani poet and journalist who represented the state of Goa was Anwesha Singbal. Previous: Tata Steel launched ‘The Green School Project– across Sukinda, Kalinganagar and Vyasanagar in Jajpur district.